A slight upgrade from the Mk II, the new edition looks pricey. If you want a top-flight 70-200mm f/2.8 lens, the Tamron G2 delivers excellent image quality, has a better stabilizer and comes at half the price. Not too long ago, we got the new and improved Canon 70-200mm f/4L IS II USM, with a wealth of enhancements and upgrades that include a completely redesigned optical path and class-leading 5-stop image stabilizer. By contrast, the only obvious difference in the new 70-200mm f/2.8L IS III USM is that, in the UK, it’s about a third more expensive than the previous edition. You could argue that, with the Mk II lens having been such a favourite of professional photographers across the world, there was little room for improvement. Indeed, the Mk III inherits the same blend of top-notch fluorite and Super UD (Ultra-low Dispersion) elements, and the same robust, weather-sealed build quality. The new lens also looks almost identical, except that it’s painted a slightly paler shade of grey. 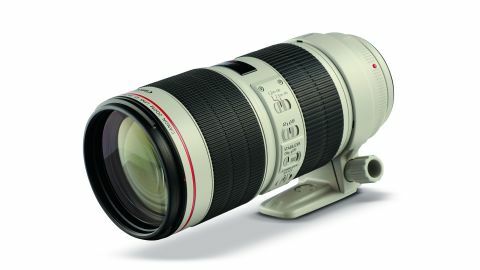 According to Canon, the Mk III is 10 grams lighter than the Mk II, but it’s still heavy for a 70-200mm f/2.8 lens, at 1,480g. It’s almost twice the weight of its new f/4 sibling and comes with a tripod mounting ring. When shooting handheld or with a monopod, Canon has revised the rating of the image stabilizer down to 3.5 stops, from the Mk II’s 4 stops. Two upgrades concern coatings. First, as in a growing number of high-end Canon, Sigma and Tamron lenses, fluorine coatings are applied to the front and rear optical elements. This helps to repel moisture and grease, and makes for easier cleaning. Secondly Canon’s high-tech ASC (Air Sphere Coating) has been added to one of the internal elements. Here’s the science bit. ASC contains microspheres of air over the vapor-deposition lens coating. The inside of the coating is therefore lined with spheres of air to give an ultra-low refractive index and exceptionally high anti-reflective performance. The upshot is a reduction in ghosting and flare. Compared with Tamron’s directly competing G2 lens, the Canon has a less effective image stabilizer, without a third switchable mode that applies stabilization only during exposures. This option makes it easier to track erratically moving objects. It also lacks a manual-priority autofocus mode, featured in some other competing lenses, which enables manual override in AI Servo mode instead of just One Shot mode. 70mm at f/5.6: As with the previous edition of the lens, sharpness is least impressive at the short end of the zoom. 200mm at f/4: Just as with the Mk II edition, f/4 is the sweet spot for sharpness at or near the 200mm focal length. The Mk II edition of the lens was renowned for its super-fast autofocus system and the Mk III matches but doesn’t beat it. In our tests, the image stabilizer of both editions of the lens proved equally effective. The downgrading of the specification to 3.5-stops seems simply because Canon, like various other manufacturers, has adopted CIPA-compliant ratings. As you’d expect, with literally the exact same optical path, the new lens is equally impressive in terms of good old sharpness and contrast as the Mk II, along with similarly good control over colour fringing and general distortion. Sharpness is impressive in the middle sector of the zoom range, even when shooting wide-open at f/2.8. There’s very little colour fringing at both ends of the zoom range, and virtually none in the middle sector. There’s very little barrel distortion at the short end, and only minor pincushion at the long end. A slight upgrade from the Mk II, the new edition looks pricey. If you want a top-flight 70-200mm f/2.8 lens, the Tamron G2 delivers excellent image quality, has a better stabilizer and is half the price.